With their faces smeared with boot polish these are the men who made up one of the deadliest commando units of the Second World War. 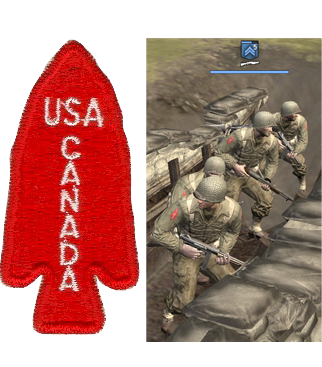 They are all members of the 1st Special Service Force - an elite unit made up of American and Canadian soldiers who captured 27,000 enemy prisoners between 1942 and 1944. The legendary special force was tasked with creating havoc behind enemy lines through sabotage and slaughter and laid the foundation for the U.S. navy SEALS and the modern day special forces in Canada. The troop were so feared by the Nazis that they earned the nickname the 'Devil's Brigade' because of their painted faces and stealth tactics. They were the subject of the 1968 movie, 'Devils' Brigade,' starring William Holden and Cliff Robertson and were also said to have inspire Quentin Tarantino's 2009 movie Inglorious Basterds. Surviving members of the crack commando unit are set to be given the Congressional Gold Medal in a ceremony in Washington today — the highest civilian honour the United States Congress can bestow. Canada's Department of Defence released the latest photos of the squad in advance of the ceremony. The Black Devils were formed in 1942 and the 1,800 strong force was primarily made up of volunteers who were previously lumberjacks, forest rangers, hunters and game wardens. 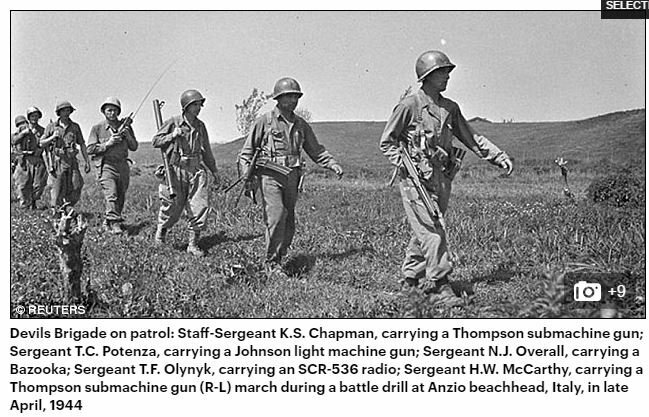 At their base in Fort Harrison near Helena, Montana in the United States, they received rigorous and intensive training in stealth tactics, hand-to-hand combat, the use of explosives for demolition, parachuting, amphibious warfare, rock-climbing, mountain warfare, and as ski troops. They even had a specially designed fighting knife made for them called the V-42. 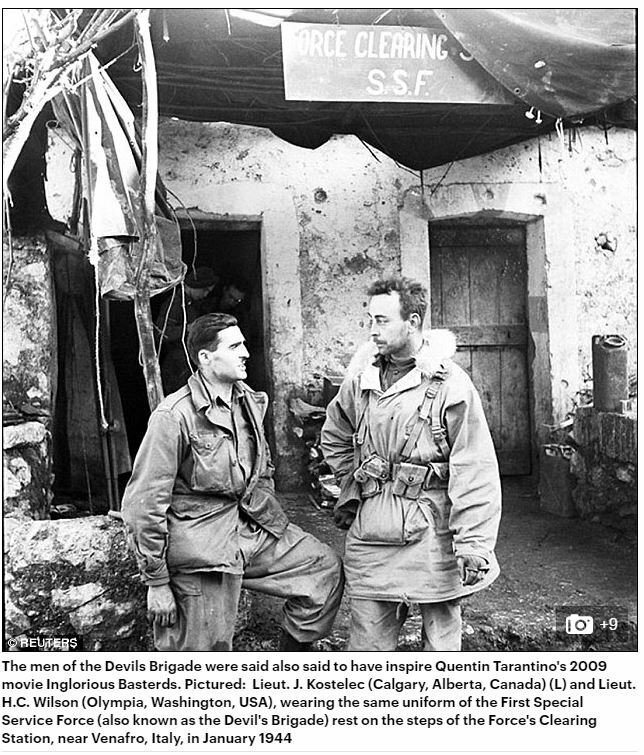 During the war they fought across Europe, in the Aleutian Islands, the Pacific and later in Italy and southern France before being disbanded in December 1944. They had parachute into German-held Norway to knock out strategic targets such as hydroelectric power plants. 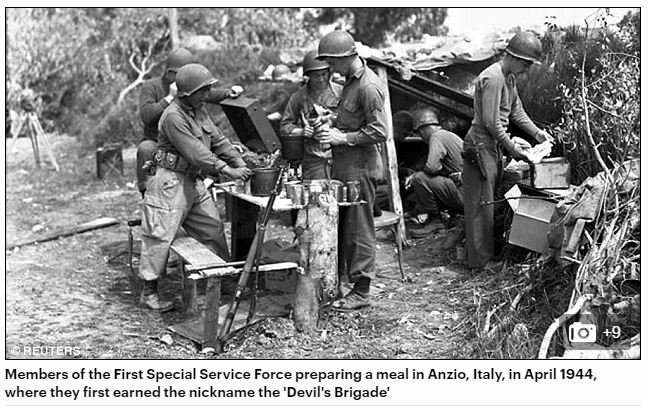 But it was during Operation Shingle in Anzio, Italy, in 1944 that they earned the nickname the 'Black Devil's. They were brought ashore to hold and raid the beachhead, which they did. A journal of a German officer which was found by allies, read: 'The Black Devils are all around us every time we come into the line. We never hear them come. 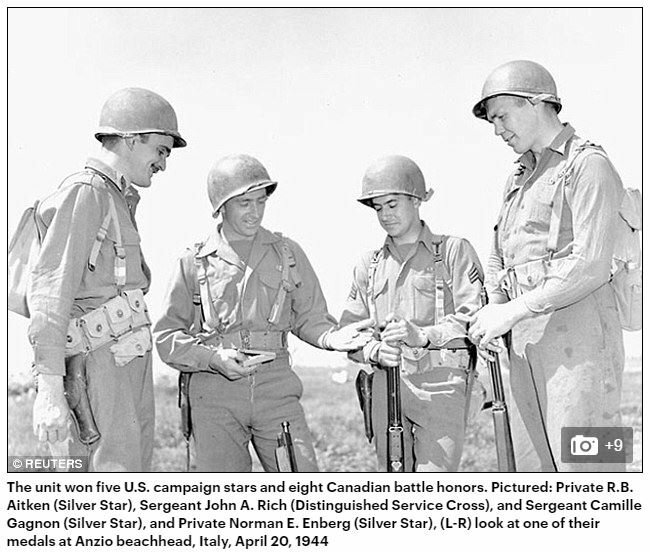 In total they saw only 251 days of combat but the force suffered 2,314 deaths, captured 27,000 prisoners and won five U.S. campaign stars and eight Canadian battle honors. The unit joins the ranks of George Washington and Nelson Mandela as recipients of the highest civilian honour the United States Congress can bestow. Around 175 surviving members will receive the gong to honour their battlefield heroics and sacrifices 70 years ago. Do you plan to buff them? Consider old hawk's idea - making rangers exclusive for inf doc but with real elite stats and rework infiltration rangers, currently they are boring copy of basic rangers with slightly better stats. Sukin-kot (SVT) wrote: Consider old hawk's idea - making rangers exclusive for inf doc but with real elite stats and rework infiltration rangers, currently they are boring copy of basic rangers with slightly better stats. Rangers, infiltration Rangers and CQB from infantry doc are being tweaked with new settings and abilities. No matter how you use them, they die quick. I think no alli player is currently using inf as shock troops anyways. Its about simple things like that they barely stand their own against most basic axis inf. If anything they can fight without being worried to lose them is Axis pioneers. And shock troops as such never existed or not the way axis inf is "portraied" in BK. Stormtroopers in ww2 (or other elites like the gebirgs in norway) were used for special missions. Kind of commando opertations. A few achieve what many couldnt in ww1. Taking bunkers, defenses and so on. Taking cruicial points with unordinary tactics. And Fallis in france, Gebirgs in norway or Rangers in italy, north afrcia or France. They basically did the same. Taking cruicial points, harass and create chaos in or behind enemie lines and working in small groups. Such "shock troops" that run towards and over defenses like medival knights didnt exist and if then only in conjunction with tanks. Besides that, as direct answer, Luftwaffe and Gebirgs are also commando units that mostly work as "fantasy shock troops" in BK. And they dont die like flys doing so. I use them as shock troops and they dont die quick for me. I mean rangers, not cqb. But there is barely anything they can do better than basic rifles. As Red said, just expensive sponges. And there is one way to make it what you claim. 3. You have boosts unlocked. Otherwise you wont even make head on attack on anything but pios. Volks with lmg will shed them when they try to close in. Yes, im not talking about history here, im talking how players use "stronger" units in bk, to make frontal push attacks with their toughtest troops, Commandos units and their equippments/abilites aren't made for that in bk. Bk isn't an historic strategic game, and will be never be an historic strategic game, same goes to bk units. Panzerblitz1 wrote: Yes, im not talking about history here, im talking how players use "stronger" units in bk, to make frontal push attacks with their toughtest troops, Commandos units and their equippments/abilites aren't made for that in bk. so, what do consider now as "commando units" and "though troops"
Basic rangers are non of that. Just expensive and last a bit longer than rifles. Its pretty obvious that Commandos are Demo troops, Infiltrations troops, Royal Marine Commandos, etc... the toughest are the strongest infantry like Fallsh/Gebs, SS troops, Stormtroops, SAS etc... why this question? Rangers aren't commandos, they are good combat units with versatile equippements like the Grenadiers. Warhawks97 wrote: But there is barely anything they can do better than basic rifles. As Red said, just expensive sponges. @Nami: still waiting for your "good SAS games replay"
sgtToni95 wrote: @Nami: still waiting for your "good SAS games replay"
I tried it but couldn't get such game. Also I realized that I always support sas with various other units so I was wrong saying that you can use "only pure" sas. But that doesn't mean that they need any buffs, just like rangers don't need any buffs. Warhawks97 wrote: No matter how you use them (Rangers), they die quick. JimQwilleran wrote: I use them as shock troops and they dont die quick for me. I mean rangers, not cqb. Warhawks97 wrote: And there is one way to make it what you claim. JimQwilleran wrote: I realized that I always support sas with various other units so I was wrong saying that you can use "only pure" sas. But that doesn't mean that they need any buffs, just like rangers don't need any buffs. Alright. But for buffed grens, storms, Luft inf its ok. Got ya. Panzerblitz1 wrote: Its pretty obvious that Commandos are Demo troops, Infiltrations troops, Royal Marine Commandos, etc... the toughest are the strongest infantry like Fallsh/Gebs, SS troops, Stormtroops, SAS etc... why this question? Coz fallis could also be considered as commandos as well. But i know that they got "wasted" for normal (defensive) frontline duties after creta. And they were really though guys. S ok.
Firstly they were half and half. They did some missions similiar to those to commandos. But also they were used like stormtroopers performing special missions during a general assault like stormtroopers. But also often wasted like fallis for normal combat duties. They are versatile, yes, but i wouldnt really consider them as good unless they got their inf doc upgrades (Red said after 12 CP). And its sad that we even put them on a level with Grens. Instead of having them elites with unit cap, weapon stats and so on. But also versatile is questionable. Equipment wise yes, Weapon wise only short ranged and anti medium tank. Last edited by Warhawks97 on 28 Jul 2017, 16:18, edited 2 times in total. Warhawks97 wrote: Alright. But for buffed grens, storms, Luft inf its ok. Got ya. They're surely more Rambo-like than any unit allies have, but they've been nerfed (at least paras) last few patches, so they're not behaving as i think you expect them to. Allies can't stop them with units in pure plan 1v1 conditions, and airstrikes are behaving poorly against them, but they usually have more tools on the field at the same time to deal with them, so you'll probably need some AT to support them (Hetzers/Stugs) , otherwise the first crusader you'll meet will put you in a lot of trouble. Sometimes a rifle section with gl and Lt can do very good against them, even if with the use of ammo abilities and command aura, so they now require some brain to be used and you can't just throw them against enemy as it used to be. @Nami, i'm very glad you realized SAS are not such a good combat unit. Btw my perplexities (and this is what our "challenge" came from) were about what should be their purpose, and why should one use them (other that dropping zooks and brens), now that marine commandos will do sabotage tasks better for a cheaper price, PIATs are working decently, and even for infantry engagements you'll get more/equally efficient units for lower price. I still NEVER saw them used in pvp games if not by players who had decided to use them before starting the game or as a "victoryparade" unit while entering enemy base. I'm not saying they need to be buffed or changed anyhow, brits already have what it takes to deal with all enemy units without them, just it's weird to see Pz.IV J on super sale "because there's nothing that would make it preferable to H version", while seing SAS in their current situation. Alright toni. I didnt say totally alone. He said that he uses rangers as "shock troops". I said what is at least required because i said that rangers can barely stand their own no matter what enemie throws at you. So i couldnt imagine how he simply uses them as shock troops. Without smoke, when enemies have not just standard defenses (which for example reg 5 etc can run over rather easily by their own). Its about that part that shock troops overrun defenses. In his case he said he does so with rangers and without smoke or any veterancy upgrades. Maybe he can give me replay where he does so. But i guess i will see a "shock assault" of rangers after the area is more or less cleaned up by lots of artillery and suppored by shermans. His simple "No" is for me like "Rangers ran over everything just like that" and killed Puma with M1 Garand rifles. And at the end i might get an answer as you got refering SAS. That he had to use this and that and etc to make rangers working for their price. Rangers should be available for the inf doc only and get some buff's or reworks, they're just normal rifles with a little more HP. Or at least leave them like they are now but buff their accuracy/damage with M1 Garands. mofetagalactica wrote: Or at least leave them like they are now but buff their accuracy/damage with M1 Garands. Which is pretty much the same of those from rifle squad. So damage output wise there is little different if you shoot with rifles or rangers at a target. If you want your units living longer you can just as well use trenches for rifles.